Jules Verne. Photo by Félix Nadar. 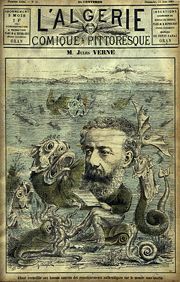 Jules Gabriel Verne (February 8 1828–March 24 1905) was a French author and a pioneer of the science-fiction genre, best known for novels such as Twenty Thousand Leagues Under The Sea (1870), Journey To The Center Of The Earth (1864), and Around the World in Eighty Days (1873). Verne was noted for writing about space, air, and underwater travel before air travel and submarines were actually invented, and before practical means of space travel had been devised. He is one of the most translated authors in the world. Verne, along with Hugo Gernsback and H.G. Wells, is often popularly referred to as the "Father of Science Fiction." Like his confrères, Verne was a visionary not only in his ability to predict technological advances but in his ability to imagine a more utopian, harmonious society as well. Jules G. Verne was born in Nantes, France, to Pierre Verne, an attorney, and his wife, Sophie. The oldest of the family's five children, Jules spent his early years at home with his parents, in the bustling harbor city of Nantes. In summer, the family lived in a country house just outside the city, on the banks of the Loire River. Here Verne and his brother, Paul, would often rent a boat for the price of a Franc a day. The sight of the many ships navigating the river sparked Jules' imagination, as he describes in the autobiographical short story "Souvenirs d'Enfance et de Jeunesse." At the age of nine, Jules and his brother Paul, of whom he was very fond, were sent to boarding school at the Saint Donatien College (Petit séminaire de Saint-Donatien) in Nantes. As a child, he developed a great interest in travel and exploration. He continued to show this interest throughout his life as a writer of adventure stories and science fiction. His interest in writing would often take away from his progress in other subjects. There Verne studied Latin, which he later used in his short story "Le Mariage de Monsieur Anselme des Tilleuls" (mid 1850s). One of his teachers may also have been the French inventor Brutus de Villeroi, who was professor of drawing and mathematics at the college in 1842, and who later became famous for creating the U.S. Navy's first submarine, the USS Alligator. De Villeroi may naturally have been an inspiration for Jules Verne's conceptual design for the Nautilus in Twenty Thousand Leagues Under the Sea, although no direct exchanges between the two men have been recorded. Verne's second French biographer, Marguerite Allotte de la Fuye, formulated the rumor that Verne's fascination with adventure asserted itself at an early age to such a degree that it inspired him to stow away on a ship bound for the West Indies, but that Jules' voyage was cut short when he found his father waiting for him at the next port. After completing his studies at the lycée, Verne went to Paris to study for the bar. Around 1848, in conjunction with Michel Carré, he began writing librettos for operettas. For some years his attentions were divided between the theater and work, but some traveler's stories which he wrote for the Musée des Familles seem to have revealed to him the true direction of his talent; stories of delightfully extravagant voyages and adventures to which cleverly prepared scientific and geographical details lent an air of verisimilitude. When Verne's father discovered that his son was writing rather than studying law, he promptly withdrew his financial support. Consequently, he was forced to support himself as a stockbroker, which he hated, despite being somewhat successful at it. During this period, he met the authors Alexandre Dumas and Victor Hugo, who offered him some advice on his writing. Also during this period he met Honorine de Viane Morel, a widow with two daughters. They got married on January 10 1857. With her encouragement, he continued to write and actively tried to find a publisher. On August 3 1861, their son, Michel Jules Verne, was born. A classic enfant terrible, he married an actress over Verne's objections, had two children by his underage mistress, and buried himself in debts. The relationship between father and son improved as Michel grew older. A typical Hetzel front cover for a Jules Verne book. The edition is Les Aventures du Capitaine Hatteras au Pôle Nord, type "Aux deux éléphants". Verne's situation improved when he met Pierre-Jules Hetzel, one of the most important French publishers of the nineteenth century, who also published Victor Hugo, George Sand, and Erckmann-Chatrian, among others. When they met, Verne was 35 and Hetzel 50, and from then, until Hetzel's death, they formed an excellent writer-publisher team. Hetzel's advice improved Verne's writings, which until then had been rejected and rejected again by other publishers. Hetzel read a draft of Verne's story about the balloon exploration of Africa, which had been rejected by other publishers on the ground that it was "too scientific." With Hetzel's help, Verne rewrote the story and in 1863 it was published in book form as Cinq semaines en balloon (Five Weeks in a Balloon). Acting on Hetzel's advice, Verne added comical accents to his novels, changed sad endings into happy ones, and toned down various political messages. From that point on, and up to years after Verne's death, Hetzel published two or more volumes a year. The most successful of these include: Voyage au centre de la terre (Journey to the Center of the Earth, 1864); De la terre à la lune (From the Earth to the Moon, 1865); Vingt mille lieues sous les mers (Twenty Thousand Leagues Under the Sea, 1869); and Le tour du monde en quatre-vingts jours (Around the World in Eighty Days), which first appeared in Le Temps in 1872. The series is collectively known as "Les voyages extraordinaires" ("extraordinary voyages"). Verne could now make a living by writing. But most of his wealth came from the stage adaptations of Le tour du monde en quatre-vingts jours (1874) and Michel Strogoff (1876), which he wrote together with Adolphe d'Ennery. In 1867 he bought a small ship, the Saint-Michel, which he successively replaced with the Saint-Michel II and the Saint-Michel III as his financial situation improved. On board the Saint-Michel III, he sailed around Europe. In 1870, he was appointed as "Chevalier" (Knight) of the Légion d'honneur. After his first novel, most of his stories were first serialized in the Magazine d'Éducation et de Récréation, a Hetzel biweekly publication, before being published in the form of books. His brother, Paul Verne, contributed to the 40th French climbing of the Mont-Blanc, added to his brother's collection of short stories Doctor Ox in 1874. Verne became wealthy and famous. He remains one of the most translated novelists in the world. On March 9, 1886, as Verne was coming home, his twenty-five-year-old nephew, Gaston, with whom he had entertained lengthy and affectionate relations, shot at him with a gun. One bullet missed, but the second bullet entered Verne's left leg, giving him a permanent limp. Gaston spent the rest of his life in an asylum. The incident was hushed up by the media. After the deaths of Hetzel and his beloved mother in 1887, Jules began writing works that were darker in tone. This may partly be due to changes in his personality, but Hetzel's son, who took over his father's business, was not as rigorous in his corrections as Hetzel Sr. had been. 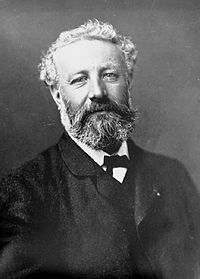 In 1888, Jules Verne entered politics and was elected town councilor of Amiens where he championed several improvements and served for fifteen years. In 1905, ill with diabetes, Verne died at his home, 44 Boulevard Longueville, (now Boulevard Jules-Verne). Michel oversaw publication of his last novels Invasion of the Sea and Le Phare du bout du monde (The Lighthouse at the End of the World). 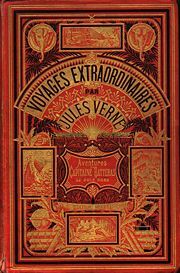 After Verne's death, the series of the "Voyages extraordinaires" continued for several years, in the same rhythm of two volumes a year. It has later been discovered that Michel Verne made extensive changes in these stories, and the original versions were published at the end of the twentieth century. In 1863, Jules Verne wrote a novel called Paris in the Twentieth Century about a young man who lives in a world of glass skyscrapers, high-speed trains, gas-powered automobiles, calculators, and a worldwide communications network, yet cannot find happiness, and comes to a tragic end. Hetzel thought the novel's pessimism would damage Verne's then booming career, and suggested he wait 20 years to publish it. Verne put the manuscript in a safe, where it was discovered by his great-grandson in 1989. It was published in 1994. While in France and many other countries Verne is considered an author of quality books for young people with a good command of his subjects—especially technological, but also political—his reputation in English-speaking countries has for a long time suffered from poor translation. Characteristic for much of late nineteenth century writing, Verne's books often take a quite chauvinistic point of view. The British Empire in particular was frequently portrayed in a bad light, and so the first English translator, Reverend Lewis Page Mercier writing under a pseudonym, cut out many such passages, for example those describing the political actions of Captain Nemo in his incarnation as an Indian nobleman. Such negative depictions were not, however, invariable in Verne's works; for example, "Facing the Flag" features Lieutenant Devon—a heroic, self-sacrificing Royal Navy officer fully the equal of naval heroes written about by British authors. Mercier and subsequent British translators also had trouble with the metric system that Verne used, sometimes simply dropping significant figures, at other times keeping the nominal value and only changing the unit to an Imperial measure. Thus Verne's calculations, which in general were remarkably exact, were converted into mathematical gibberish. Also, artistic passages and whole chapters were cut because of the need to fit the work in a constrained space for publication, despite the effect on the plot. For those reasons, Verne's work initially acquired a negative reputation in English speaking countries as not fit for adult readers. As a result Verne was not taken seriously enough to merit new translations, leading to those of Mercier and others being reprinted decade after decade. Only from 1965 on were some of his novels re-translated more accurately, but even today Verne's work has still not been fully rehabilitated in the English-speaking world. Verne's works also reflect the bitterness felt in France in the wake of defeat in the Franco-Prussian War of 1870 to 1871, and the loss of Alsace and Lorraine. The Begum's Millions (Les Cinq cents millions de la Begum) of 1879 gives a highly stereotypical depiction of Germans as monstrous cruel militarists—in marked contrast to pre-1871 works such as Journey to the Centre of the Earth, in which almost all the protagonists, including the sympathetic first-person narrator, are German. Hetzel's influence on Verne's writings was substantial, and Verne, happy to at last find somebody willing to publish his works, agreed on almost all changes that Hetzel suggested. Not only did Hetzel reject at least one novel (Paris in the Twentieth Century) completely, he asked Verne to change significant parts of his other drafts. One of the most important changes Hetzel enforced on Verne was to change the pessimism of his novels into optimism. Contrary to common perception, Verne was not a great enthusiast of technological and human progress (as can be seen from his early and late works, created before he met Hetzel and after his death). It was Hetzel's decision that the optimistic text would sell better—a correct one, as it turned out. For example, the original ending of Mysterious Island was supposed to show that the survivors who return to mainland are forever nostalgic about the island, however Hetzel decided that the ending should show the heroes living happily—so in the revised draft, they use their fortunes to build a replica of the island. Many translations are like this. Also, in order not to offend France's then-ally, Russia, the origin and past of the famous Captain Nemo were changed from those of a Polish refugee avenging the partitions of Poland and the death of his family in the January Uprising repressions to those of an Indian prince fighting the British Empire after the Sikh War. Verne wrote numerous works, most famous of which are the 54 novels part of the Voyages Extraordinaires. He also wrote short stories, essays, plays, and poems. ↑ Adam Charles Roberts, "The History of Science Fiction." Retrieved June 15, 2007. "Jules Verne: Father of Science Fiction? ", John Derbyshire, The New Atlantis, Number 12, Spring 2006, pp. 81-90. A review of four new Jules Verne translations from the "Early Classics of Science Fiction" series by Wesleyan University Press. Zvi Har'El's Jules Verne Collection, including the Jules Verne Virtual Library, with free online versions of 51 of Jules Verne's novels translated into eight languages. Jules Verne French Stamps - 2005, "Les Voyages Extraordinaires"
This page was last modified on 13 June 2018, at 15:10.